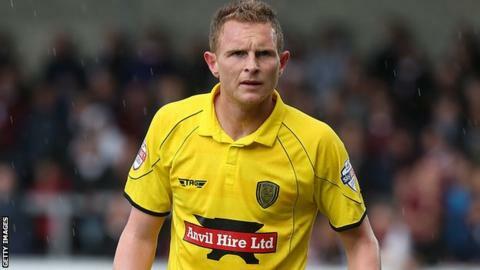 Burton moved up to third in League One as Stuart Beavon's goal gave them victory against Rochdale. The 31-year-old striker got a touch to Mark Duffy's free-kick to direct the ball past goalkeeper Josh Lillis midway through the first half. Lucas Akins then shot wide from 10 yards for the hosts, before Beavon was denied a second by the legs of Lillis. Rochdale rarely threatened, with substitute goalkeeper Remi Matthews not making a notable save. "We do respect Rochdale a lot. They are a very good team who can mix it up. "They can go direct, they can play, they can pass and I do rate them really high. We knew we had to match them and I think we've done that ever so well. "We had the better chances in the game. They might have had a little bit more of the ball but I don't remember them having a chance." "I'm disappointed that we didn't play with the intelligence that I expect the players to perform under. "The opposition made it easy for us to go long, but we took that choice instead of making the right decisions. "I think we're a good outfit, good squad, I think we've got plenty to offer but we've got to show more intelligence at breaking the opposition down when they take the goal lead like they did." Match ends, Burton Albion 1, Rochdale 0. Second Half ends, Burton Albion 1, Rochdale 0. Reuben Noble-Lazarus (Rochdale) is shown the yellow card for a bad foul. Attempt blocked. Tom Kennedy (Rochdale) left footed shot from outside the box is blocked. Anthony O'Connor (Burton Albion) wins a free kick in the defensive half. Substitution, Burton Albion. Anthony O'Connor replaces Mark Duffy. Attempt missed. Philip Edwards (Burton Albion) header from the centre of the box is close, but misses to the right. Corner, Burton Albion. Conceded by Reuben Noble-Lazarus. Attempt saved. Philip Edwards (Burton Albion) right footed shot from the right side of the box is saved in the centre of the goal. Corner, Rochdale. Conceded by Shane Cansdell-Sherriff. Joseph Rafferty (Rochdale) wins a free kick on the left wing. Hand ball by Calvin Andrew (Rochdale). Attempt missed. Lucas Akins (Burton Albion) right footed shot from the centre of the box is close, but misses to the left. Peter Vincenti (Rochdale) wins a free kick in the attacking half. Substitution, Rochdale. Lewis Alessandra replaces Donal McDermott. Damien McCrory (Burton Albion) wins a free kick on the left wing. Substitution, Rochdale. Nathaniel Mendez-Laing replaces Matthew Lund. Substitution, Burton Albion. Tom Naylor replaces Jerome Binnom-Williams. Corner, Rochdale. Conceded by Jerome Binnom-Williams. Shane Cansdell-Sherriff (Burton Albion) is shown the yellow card for a bad foul. Attempt blocked. Lucas Akins (Burton Albion) right footed shot from outside the box is blocked. Attempt missed. Callum Butcher (Burton Albion) right footed shot from outside the box misses to the right.